The following post was originally featured on March 24, 2015. The Maritimes are on the brink of catastrophic economic and demographic failure . Our lack of entrepreneurial spirit, engrained sense of entitlement, conservatism, and folksy racism are major factors preventing us from joining in the prosperity enjoyed by our more enterprising cousins in the “have” provinces of Canada. Such are the problems enumerated in John Ibbitson’s recent Globe and Mail editorial. The “culture of defeatism,” proclaimed by Steven Harper in 2002, is apparently still alive and kicking on the east coast. Despite the popularity of this analytical framework, it is not borne out in the historical literature surrounding region and regionalism in the Maritimes. Nor are the commonly proposed solutions to the actual problems facing the region particularly novel or creative, including those enumerated within the much-lauded Ivany Report in Nova Scotia. 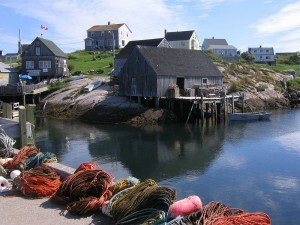 The regional stereotype of the staid and conservative Maritimes is not a recent phenomenon. Historian Ernie Forbes traces the lineage of this notion to 1893, when Frederick Jackson Turner described the “frontier thesis” of American westward development. According to Turner, a profound sense of nationalism and a progressive liberal spirit was the result of continued expansion and settler colonialism in the American west. This concept was readily applied to the Canadian national narrative.